Disney has just released THE LION KING 1.5 and THE LION KING 2: Simba’s Pride on Special Edition Blu-ray Combo Pack! Go back to the jungle with Timon, Pumbaa in The Lion King 1.5 to discover the dynamic duo’s origins and how they came to save the Serengeti. Follow Simba’s daughter, Kiara, in The Lion King 2: Simba’s Pride as she seeks out her own adventure. The original voice cast returns for each film to expand the tales of the circle of life! 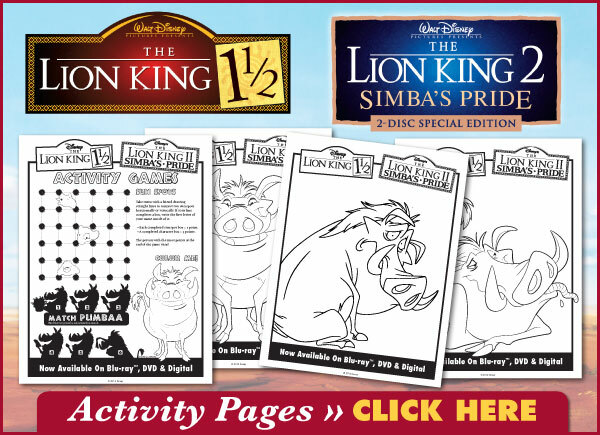 Download Fun Activity Pages to Keep Your Pride Busy!